Style A solid hardwood floor is an asset to every interior. It brings a distinctive feel of class and elegance. The combination of the various species of wood and the different designs and finishes make it possible to create a unique style to suit all purposes. Health A solid hardwood floor has a durable, hardwearing and long lasting surface. It is easy to keep clean and maintain. They contain no chemicals or toxins. Are free of dust mites a benefit to allergy sufferers. Creating a healthy living environment. Investment A solid hardwood floor is an excellent investment. Adds value to your home. Lasts for generations. Increases in value. A good thermal insulator. If needed, repaired and refinished many times. Environment A wood floor is an environmentally sound choice when the timber is sourced from sustainably managed forests. It is naturally renewable. To convert the wood to the final product requires low energy inputs to harvest, transport, dry and mill. And, finally, it can be recycled. Parquet Classic patterns and contemporary combinations. Stylish shapes and colours to bring interest and character to your home. Parquets versatility offers a base for creative design. It has excellent stability and is used for underfloor central heating systems. Hardwood battens or strips cut in length and width according to pattern requirements. Direct application to fully supporting wood base sub-floor. 6mm, 10mm or 14mm thick. 10mm the most popular. Woodblock Individual blocks laid in a variety of patterns, single or double herringbone. Basket or herringbone laid straight or diagonally. French herringbone. Woodblock imparts a sophisticated charm to any room. Hardwood blocks with a system of interlocking usually 15mm, 20mm or 22mm thick. Up to 90mm wide, predominantly 70mm. Various number of lengths from 200mm up to 500mm. Interlock Tongue & Groove glued to the sub-floor. Mosaic Simple but effective hardwood floor. Gives a uniform appearance. Usually 8mm thick. Consists of 4 or 5 fingers in a square form approx. 120mm. Woodstrip A natural pure style giving a tranquil timeless look. Usually 20mm thick. Interlock Tongue & Groove. Less than 100mm wide. Predominantly nailed to bearers (joists or battens) or on to a fully supporting base (floorboards, plywood or concrete). Overlay Appearance similar to woodstrip. Interlock T&G strips of hardwood 10-15mm thick. Laid on to a fully supporting base. Wood Board Flooring (Planks) A strong, natural feel for both traditional and contemporary interiors. Length of hardwood or softwood usually from 0.5 metres up to 3 metres. 20-22mm thick. Predominantly Interlock T&G. Width more than 100mm. Fixed to bearers (joists or battens) or on to a fully supporting base (floorboards, plywood or concrete). Borders Borders give an unmistakable air of elegance and charm to a room. Laid around the perimeter of a room using a variety of hardwoods in contrasting colours. All floors can be accented with either elaborate or simple borders. Engineered Floors (Panel Floors) A layer of hardwood veneer l-6mm thick. Glued to a plywood, blockboard, HDF (Hard Density Fiberboard) or chipboard panels, having interlock T&G or self-locking edges. Floating floor This is a method of construction where the top part of the floor is laid on top of the base without being positively fixed. Often with re-silent shock absorbing material between. a. UNFINISHED. Floor to be sanded to the required smoothness after installation and coated with desired finish. b. PRE-SANDED Surface of the wood is ready to accommodate the desired finish. c. PRE-FINISHED Factory applied finish in either lacquer or oil. Some may need additional coating after installation. Sports Floors, Dance Studio Floors, Multi-purpose Rooms for Physical Activities These floors are usually strips of hardwood positively fixed to wooden battens using the secret nailing method. Continuous foam film or rubber pads are used in order to provide the re-silent effect and control shock absorbance. There are many specific systems designed for this purpose, relying on a combination of natural elasticity of the wood and the rubber padded cradles. Semi-non slip finishes applied to dance and multi-purpose floors. High performance sport finishes to sports floors. Noise reduction Floors(Re-silent Floors) In order to reduce the impact of airborne sound, a layer of shock absorbing foam, rubber or other sound deadening material is incorporated in the floor construction. This method maybe used in new builds, conversions and refurbishments, providing measurable results approximately 15-20 db. The preferred system for hardwood floors is the low temperature water-based system with an even temperature distribution. A wood based sub-floor, plywood on battens, rather than concrete is recommended. As a large mass of concrete screed exposed to temperature changes leads to screed movement at a different rate from the attached wood. 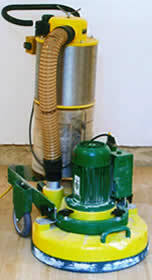 The concrete also requires a larger amount of heating energy which gives a slow response. a. The system should have a built-in temperature gauge. As the temperature of the sub-floor should not exceed 27 Degrees Celsius. b. A stable wood of modest width is recommended. The right moisture content of the wood 6-8 is vital to its success. Quarter-sawn cut wood is highly recommended. c. The overall heating requirement to be below 70w/m2. To meet this requirement some older properties will require additional insulation or a complimentary heating system. For specific information please contact our office. The right care and appropriate maintenance will considerably extend the life of a wooden floor. A preventative measure would be to install good quality doormats of sufficient size, placed outside and inside external doors. A wide range of felt pads, caps and castors are available, to avoid damage by standing or moving elements on the floor. a. Keep the floor clean and dust- and grit-free by regular vacuum cleaning or sweeping with a soft brush. b. Wipe off any spillage immediately. c. Periodically wipe the floor, keeping the amount of water to a minimum. Where appropriate, apply the maintenance product. d. Regularly, examine the floor surface. Where excessive wear is noticed, the surface can be rejuvenated by re-applying the finish. Our modern equipment ensures high productivity as well as a relatively clean working environment. 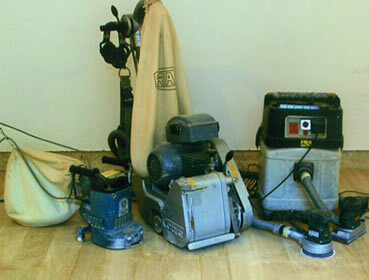 Please note that all the tools have their own built-in dust extractors or are connected to powerful vacuum units. Due to technical limitations, the actual colours of samples may differ from those shown. Copyright © ART Hardwood Flooring 2005. All rights reserved. No image may be reproduced without permission.